There’s nothing like a cozy wrap to keep out winter’s chill. That’s true whether you’re talking about people or pipes. Take steps now to protect your plumbing, ahead of the season’s first hard freeze, and you’ll avoid the damage of frozen pipes. Camas and Vancouver, Washington generally have mild winters, but there are usually times each year when the mercury drops and pipes can freeze. Here’s what you need to know to keep pipes toasty and water flowing during cold weather, and if you’re seeing this post a little too late, what to do if your pipes burst. The pipes that run through unheated areas of your home are the ones most likely to freeze. This includes pipes in exterior walls and plumbing that’s on the outside of buildings. Take a look around the attic, crawl spaces, garage and other unheated sections of the house. If you see exposed pipes, they’ll need to be protected. Wrap foam pipe insulation on any exposed plumbing. Foam insulation is inexpensive, effective and easy to install. As an added bonus, the foam may reduce the cost of heating your water since it keeps your pipes and water a few degrees warmer. Exterior walls need to have enough insulation to protect plumbing. If your walls lack insulation, or if the insulation wasn’t properly installed, your pipes could freeze. Pipes to the kitchen sink often run through an exterior wall. If you see water damage, mold or mildew in that area, it’s possible the pipes froze and leaked or burst in the past. Adding more insulation to the wall may prevent future problems. As a stopgap measure, during a freeze you can leave the under-the-sink cabinet door open so warm air reaches the wall. It’s also important to get your outdoor plumbing ready for winter. 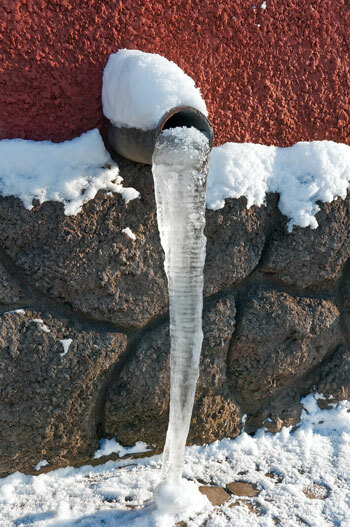 A frozen outdoor hose can damage interior pipes. How does this happen? Water expands as it freezes. When water freezes in a hose, it may put pressure on the closed faucet and pipes. Pipes eventually burst under the stress. Drain garden hoses, disconnect them and store them for the season. Close the interior shut-off valve to outdoor faucets. Drain the spigot and place foam insulators on each outside faucet. Even if you take preventative measures, one of your pipes could leak or break. Know where to find the water main. 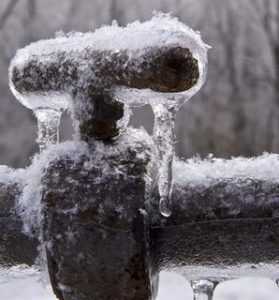 If your pipes freeze, you’ll need to quickly shut off your home’s water to prevent flooding. Pipes that freeze and then defrost have an increased chance of bursting, causing water leaks that can lead to floods that damage the structure of your home as well as your valuables. One way to avoid this hassle is to educate yourself so you are ready in the event of a plumbing emergency. If you suspect you have a frozen pipe, don’t panic, but do take action. Call a trusted plumber immediately to report the issue. Do not attempt to thaw a frozen pipe with an open flame. This process can be dangerous and inefficient. Instead, you may be able to thaw the pipe with a hand-held hair dryer. Simply open the faucet and apply heat to the pipe slowly, beginning close to the faucet end and moving toward the frozen area. While working on your leak or burst pipe, be sure you are not standing in water. Doing so while working with electrical items can cause electrocution. Simpson Plumbing can help you take care of your pipes all year round. Call us today to find out more about winter-ready plumbing and our affordable preventative maintenance plans.